TGOOD HV GIS utilizes maintenance-free SF6 gas insulated breakers for an extremely compact and versatile switchgear solution for challenging, space-constrained projects. Our integrated, modular GIS eliminates much of the expense, complexity and cost associated with traditional GIS systems. TGOOD GIS modules are used in a variety of substation solutions including the Compact 145kV GIS Substation. High performance alternative to air insulated systems. Immune to harsh environmental conditions. Sealed GIS is safe to touch and inherently arc-resistant. Compact factory-pressurized modules save space and reduce cost compared to traditional GIS. 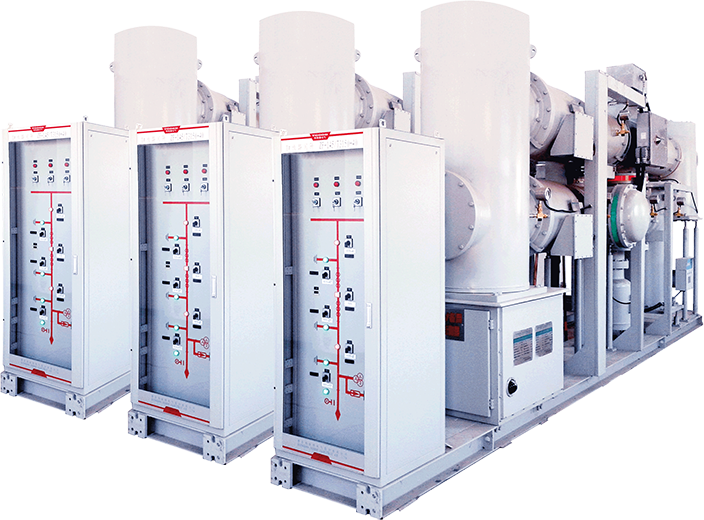 May be pre-assembled within a prefabricated E-House or mobile trailer-mounted substation. Compact design ideal for space-constrained projects in crowded cities and congested industrial zones. Outstanding performance in harsh environments, including high altitude, heavily polluted, coastal, desert and Arctic sites. Low audible noise and electric field emissions make this product attractive for densely populated areas. Grounded tank design is safe to touch, no exposed voltage. Modules connected with gas-tight flanges, delivering decades of reliable operation.